In his stunning debut, Gregory Scott Katsoulis has paints a chilling world that feels all too familiar. This novel puts a price on words. The book feels futuristic, but also feels as though it is not so far off. I loved that Speth, the main character, never meant to start a revolution; everyone just made assumptions about her silence, and it spiraled from there. I also loved that there were no love interests, as is often seen in dystopian novels. I love a great love story just like everybody else, but the lack of it felt much more realistic, especially in this story. Speth was smart, resourceful, and overall an awesome and strong lead character. The little plot twists that appeared throughout the story were very well written, and I hadn’t seen them coming. Speth becoming a placer allowed for more well written supporting characters, and I loved the scene where Henri and Speth look through an old school yearbook, and how the school was named ‘Lincoln’ and the year was 1984, which I assumed was referencing how Abraham Lincoln ended slavery and the novel ‘1984’. 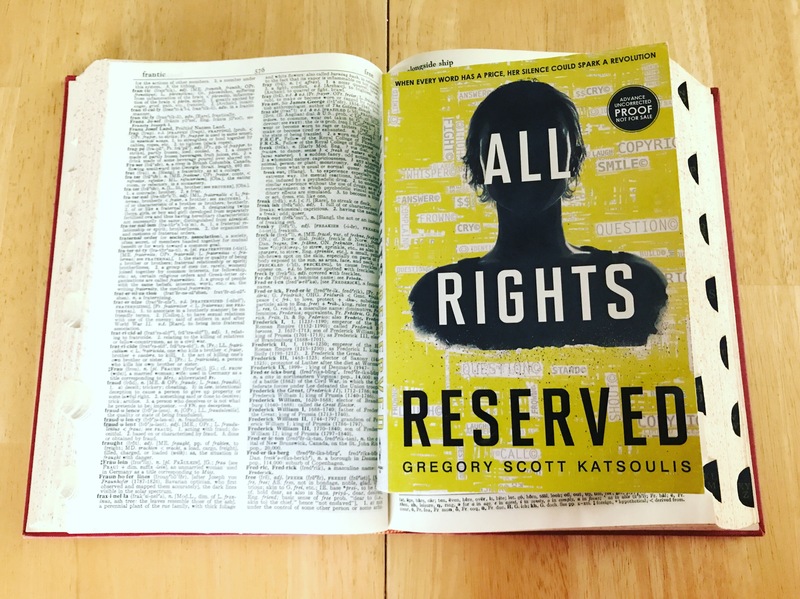 ‘All Rights Reserved’ in itself is very reminiscent of George Orwell’s ‘1984’, and overall I found the book to be extremely engaging. It reminds us of the power that words have over us, whether good or bad, and shows a dismal future where freedom of speech has been completely abolished. Overall, I would recommend this book to anyone who read and was intrigued, if not unnerved, by George Orwell’s ‘1984’, and who wants a though provoking read. *I received this book from a fellow reader! ARR was released by Harlequin Teen on August 29!